Eggplant is a funny vegetable. It’s not a vegetable that inspires passion, the way that asparagus or ramps do in springtime. It’s not a vegetable that anyone would put on a short list of favorite foods. If the farmer’s market held a prom, I’m pretty certain eggplant would be sitting by itself on a bench, chatting uneasily with a turnip, and waiting—hoping—someone might just ask it to dance. Well, eggplant, here I am in my tux: waddya say we ménage a trios with some tomato and basil? 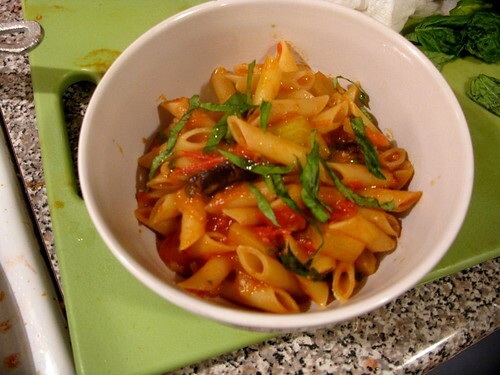 No, no, silly eggplant, we’re not going to make love—sorry—but we ARE going to make something better: Pasta alla Norma!